This 2011 Specialized Crux Comp was my reward after dropping the first 15 lbs off my baby rhino body. I knew I would stay on it once I saw results so I decided the purchase was worth it. I was riding the Giant MTB till then and could tell there were some issues with that bike so instead of repairs, I replaced. The wife agreed that it was a good idea to reward the goals achieved so who was I to argue another bike – especially when the approval comes from my better half. Overall she is a no-nonsense bike that needs little more than some cleaning and basic drivetrain maintenance. Problem free she just cranks it on the path or road and I love her. This baby has become my all around ride. Crummy weather- check, crappy gravel- check, cyclocross mud baths- check, gravel, pavement days- check. I even picked up a pair of studded tires for ice should I ever decide to ride her over some frozen swedish fjords. Crummy weather- check, crappy gravel- check, cyclocross mud baths- check, gravel, pavement days- check. 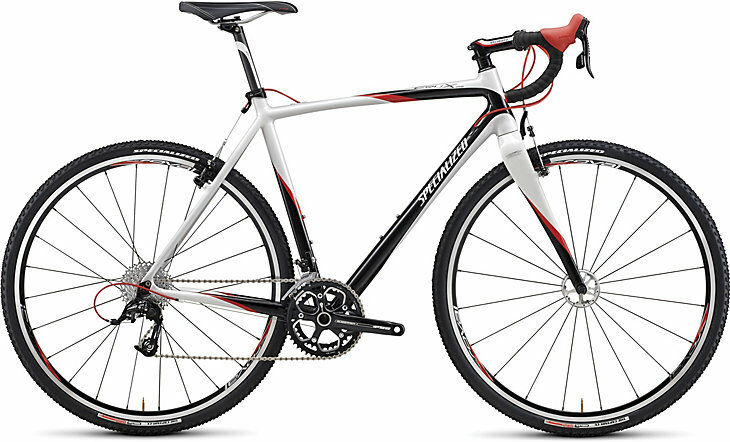 Shown is the catalog stock shot of my 2011 Specialized Crux. Hope to provide an update but for now the base bike is the same with a few upgrades. Since I bought it I probably have put about 25,000 miles on it and I have yet to swap the bottom bracket. Overall it is pretty stock but I have swapped a few components. I’ve cradled my tush with a nice Specialized Romin saddle, added some FSA wing compact pro bars and lightweight stem and upgraded the Sram Apex to Force shifters. The rear and front derailleurs were also upgraded to Force. Also while everything else was being switched out I upgraded the chain and cassette to the Sram 1070 cassette/1091R chain for a smoother shift. The best part of this bike to me are the bombproof Roval Pave SL high flange hub equipped wheel set- again not the lightest out there but barely ever been trued since I had the bike. Nothing missing from this bike as it keeps me happy no matter where I ride her.